This collection of adorable and whimsical graphics is EXCLUSIVE to Scrappin' Graphics. Perfect for all your little boy project needs. These Line Art/ Digital Stamps/Pattern/Outlines come in one sheet, where they can be separated to create digital stamps or colored and use to create you own clip art. Use these in scrapbook pages, card making, digitized embroidery patterns, coloring pages, printable crafts and much more. They cannot be used to create clip art sets. They need to be be made into something else. 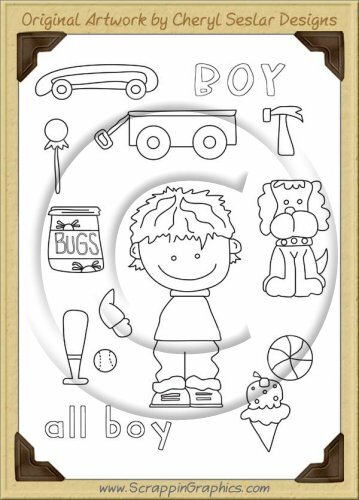 This sheet includes: little boy, wagon, race car, dog, bug jar, hammer, baseball bat, ball, lollipop, peppermint candy, ice cream cone, Boy word art. These large 300 dpi graphics work well for your printing and crafting needs but can easily be reduced in size for use in web designs. The graphics come in high quality JPEG format only. This product was added to our catalog on Thursday 01 December, 2011.